Wholesale distribution is a balancing act. Midsize distributors must walk a careful line between satisfying manufacturers as well as customers-and remaining profitable. If a distributor increases its prices too much, the manufacturer may choose to sell its products through a competing distributor or directly. And if the distributor substantially lowers its prices, the organization risks going out of business. With these limitations on pricing, wholesale distributors seek to maximize profits by optimizing operations. An enterprise resource planning (ERP) solution can help distributors streamline inventory management, warehouse management and financials to increase efficiencies and profit margins. However, one-size-fits-all ERP solutions can introduce overhead and limit future business growth. Distributors require scalable solutions built to meet their unique needs while enabling them to take advantage of new business opportunities. 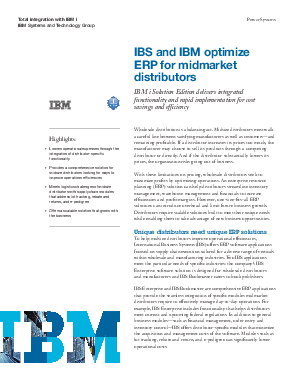 This white paper explains how IBS's ERP applications enable improved efficiencies, scalability and cost savings.